Here you can view all our blog posts from this trip in November 2016 in chronological order. It took us a long time to decide where to go this holiday. I think the fact that we had only 1 week really impacted the decision. When I asked Pete what he wanted he said “sun” and “something different”, for me these 2 things would direct me to South East Asia or South America, but with destinations in those areas a minimum of 10 hours flight away, we were limited to North Africa and Southern European Islands. 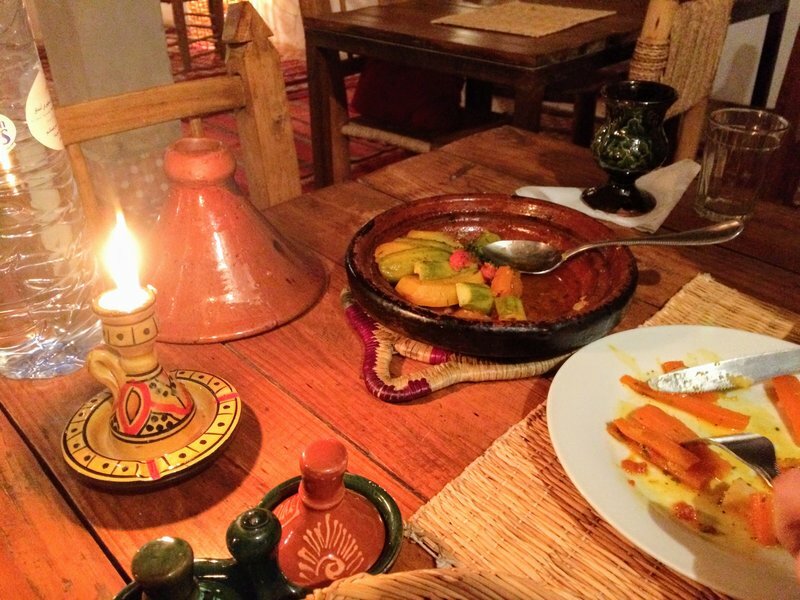 Out of these Morocco seemed the obvious choice for food, culture, architecture and adventure. 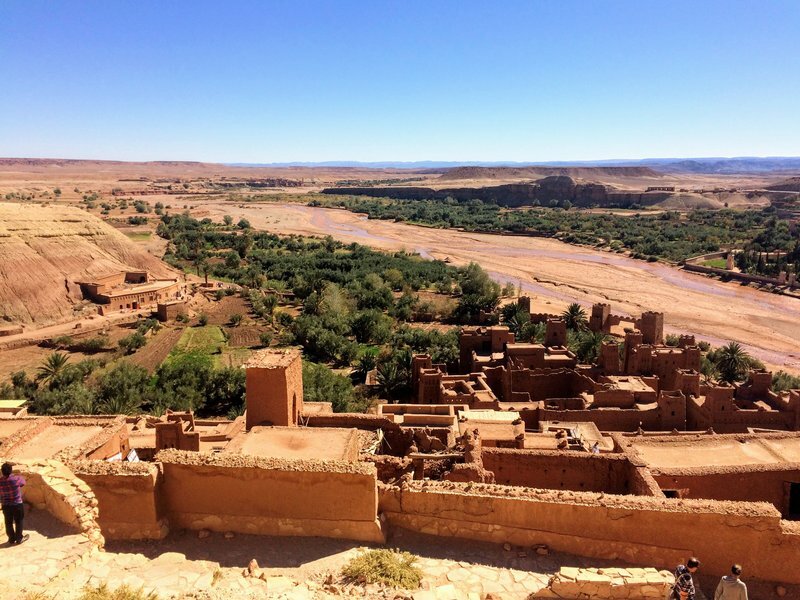 It then took me a long time to decide where in Morocco to go… it’s a vast country with lots of diversity in both landscapes and culture. 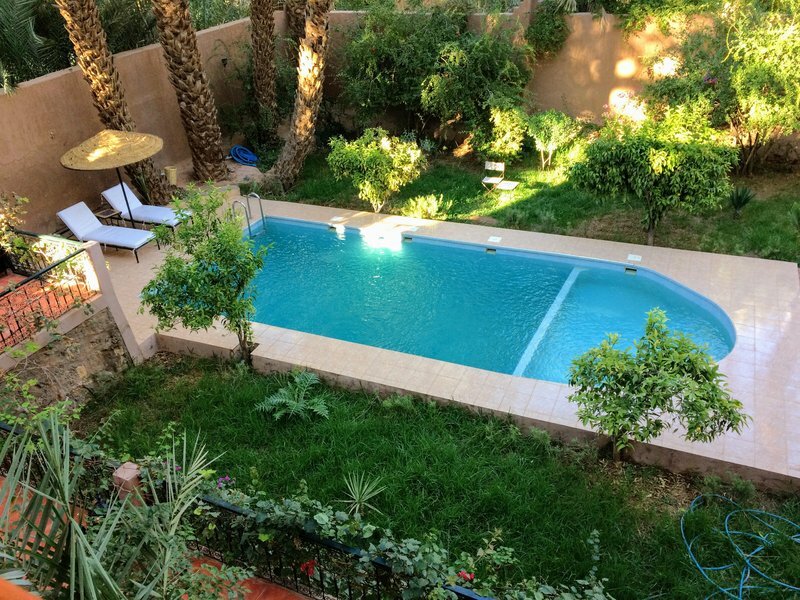 In the end, it was based on convenience and the price of the flight to Marrakech. We knew we wanted an adventure and travelling-based holiday, but after hours and hours of researching different cities and methods of transportation, we decided to just hire a car and wing it. I got the car via AutoEurope again and it was £94 for a Fiat Punto for the week. I also got the carhireexcess cover for £15 for the week to avoid paying extra fees or a huge excess should anything happen. 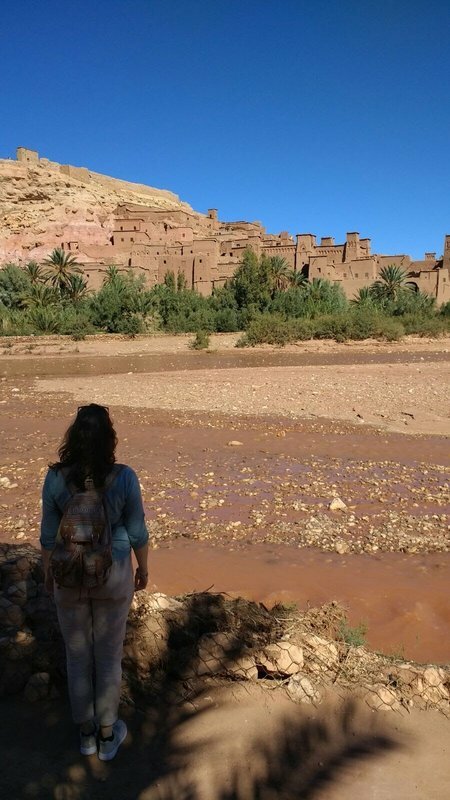 And then with everything booked and Chip settled at a friend’s home, we set off on our adventure to Morroco! 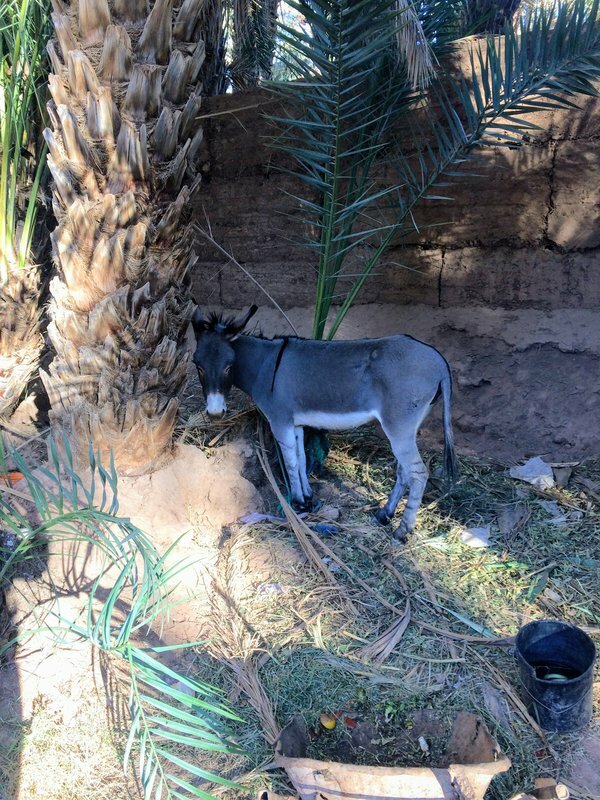 Well… at least we tried to leave Marrakech… we had downloaded satnavs for our phones, but even they found navigating through the Medina difficult as they didn’t seem to understand the concept of one-way streets. We seem trapped inside the walls of the city and so just drove as close to the wall as possible on a parallel road until we found the nearest exit! 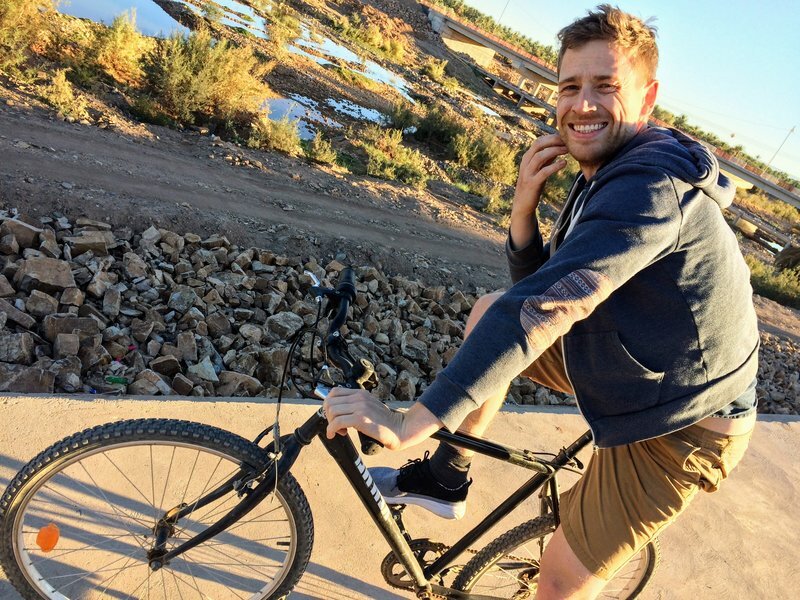 Unfortunately, outside of the city the driving didn’t seem to improve as Moroccan’s seem to have zero patience on the roads and certainly don’t stick to the highway code as Pete and I do. Not as we experienced it anyway. We got cut up, tailgated, flashed at, pulled out on, beeped at, shouted at and flagged down by what seemed like every other car on the road! It was daunting at first, but Pete soon got used to it and I learned to divert my attention to the scenery and looking out the window! 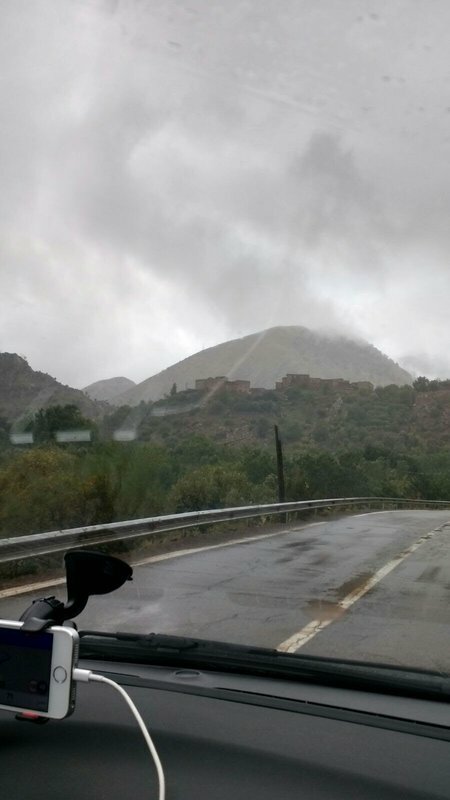 It had rained in Marrakech the whole night before and was still raining in the morning when we set off. 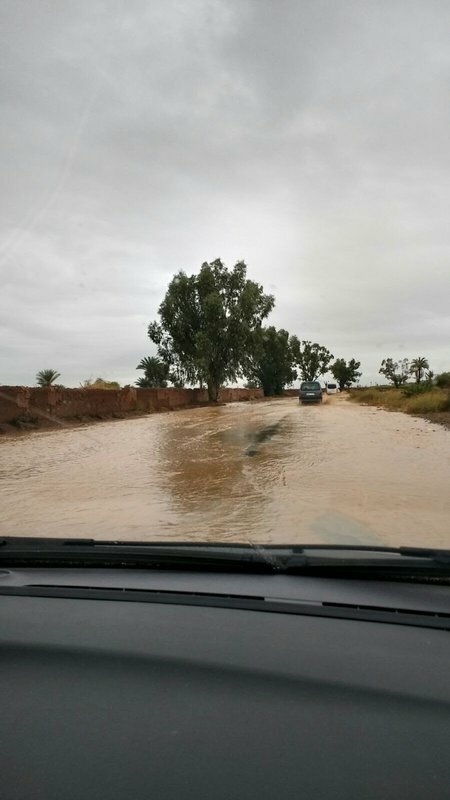 We figured that Morocco isn’t that used to the rain because all the roads had flooded…. quite badly. Had the roads not been busy so we were able to follow someone to know how deep the water was, we may have turned around and waited for the waters to recede. …I think this was when we decided that we should make sure our plans included a return trip back over this mountain pass on a more sunny day. We arrived at our guesthouse which was still high in the mountains but at least to the south of them. 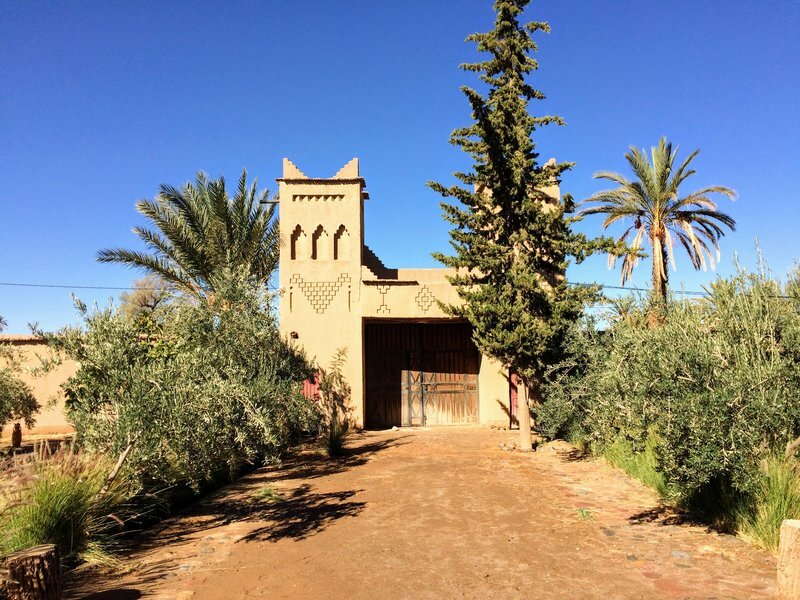 Riad Irocha was a small guesthouse in Tisseldei, a very sleepy village with only a handful of houses. It was lovely and the owner, Ahmed, was very hospitable. We ate some tasty food here and then took a short walk out of the riad down into the village and then to the palmerai (oasis) which was about 5 min walk over the road. 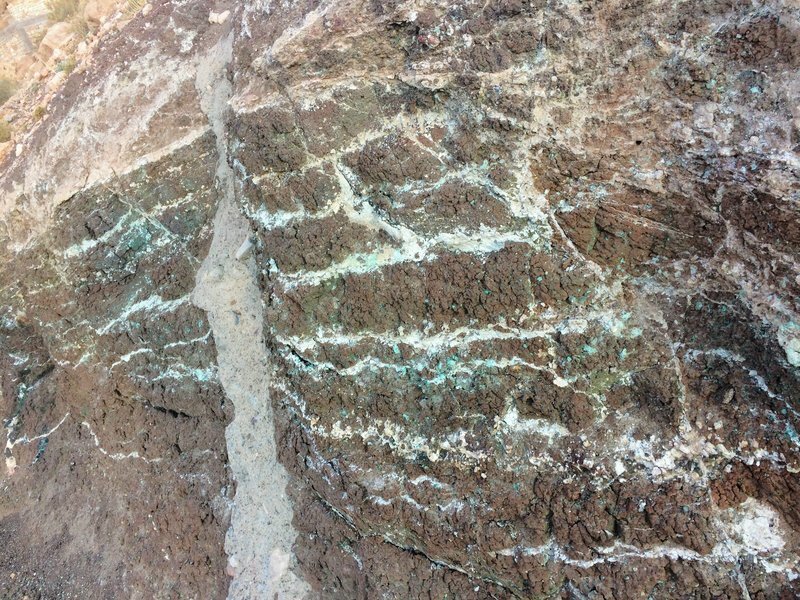 The best, and most unusual, part of this village was the geology and rocks. They were incredible as you could see the veins of quartz and metal ores running through them. We dug quite a few bits of quartz out for ourselves which we have on display in our house now. But they are not nearly as striking as how they appeared buried in the rock face. 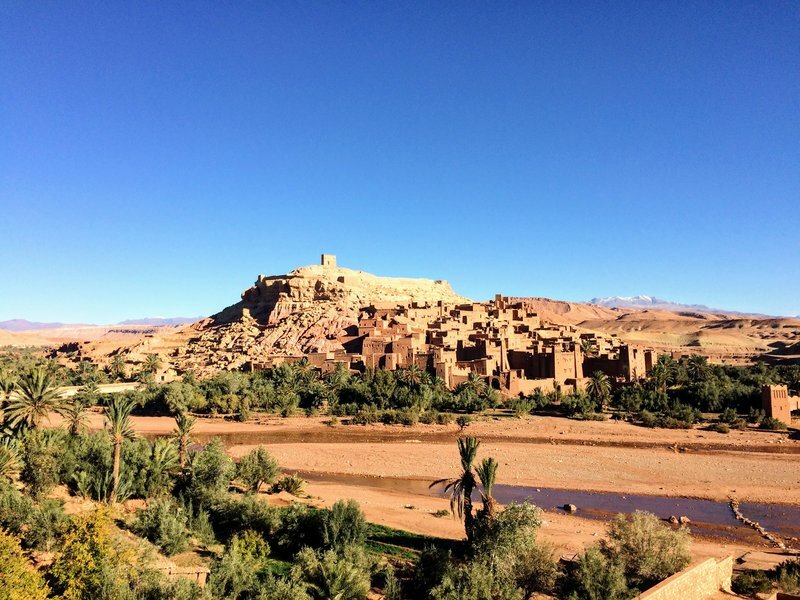 However, we focused on the day ahead as I had planned for us to visit the iconic Kasbah of Ait Ben Haddou. 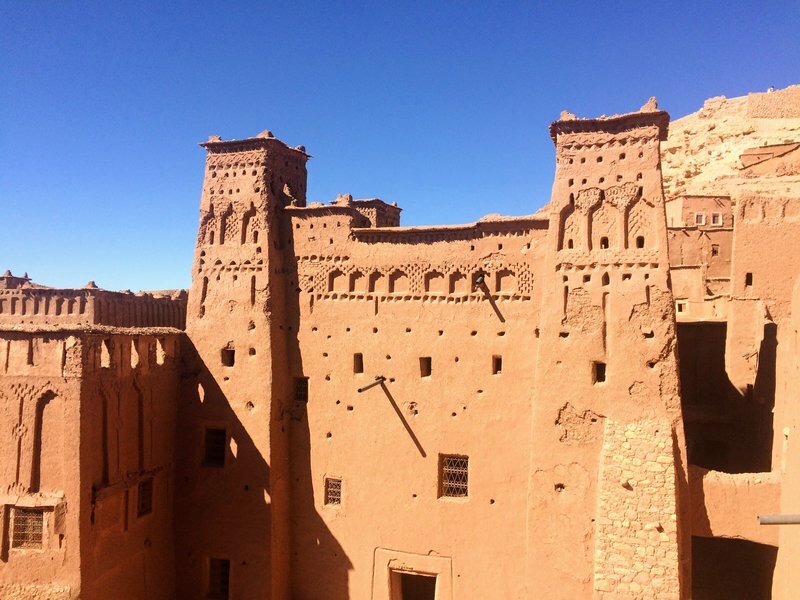 A traditional fortress and village built of mud brick and carved into the hillside. 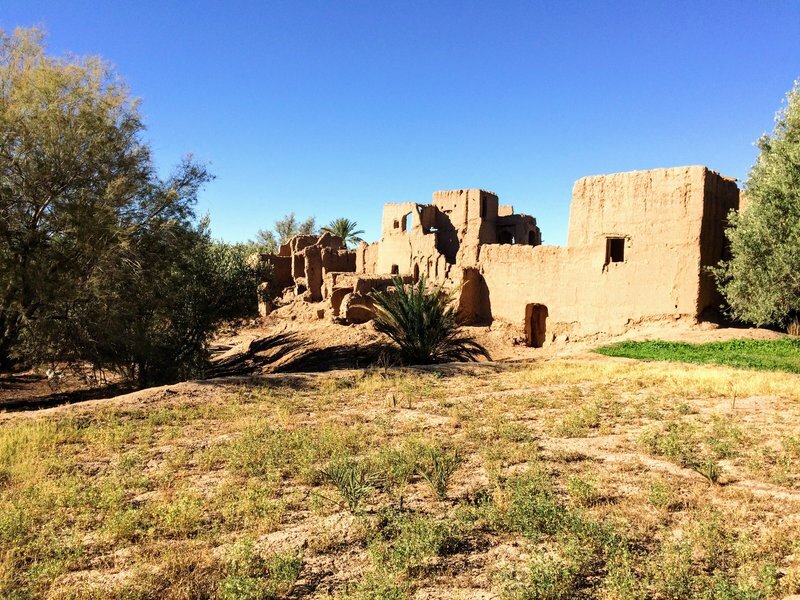 I thought that this might be one of the few places where we would see the traditional mud houses, but as we journeyed from Tisseldei towards it we noted that all the houses we could see were, in fact, mud/clay houses. 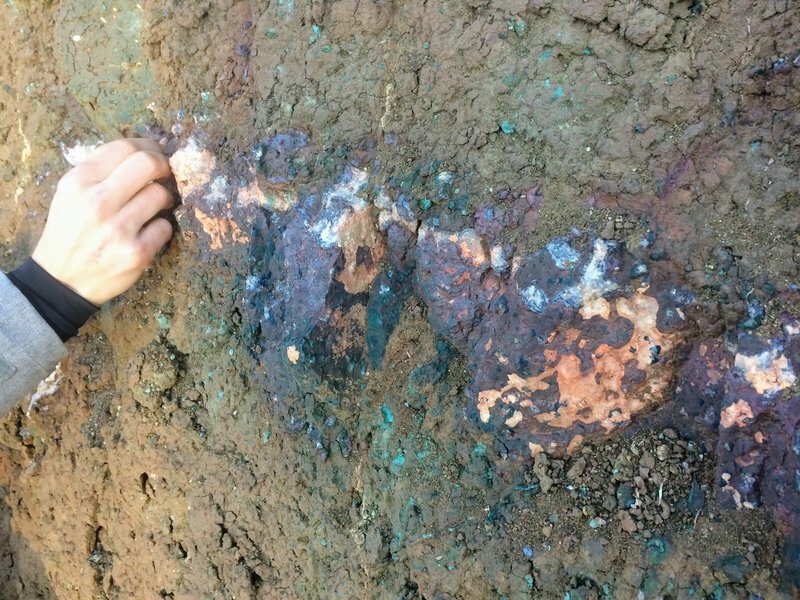 They blended into the landscape, clearly made from the mud/clay on which they were built. The only colours we saw to complement this were greens and blues, which only added to the natural charm of the buildings. The intricate carvings also housed smaller birds! 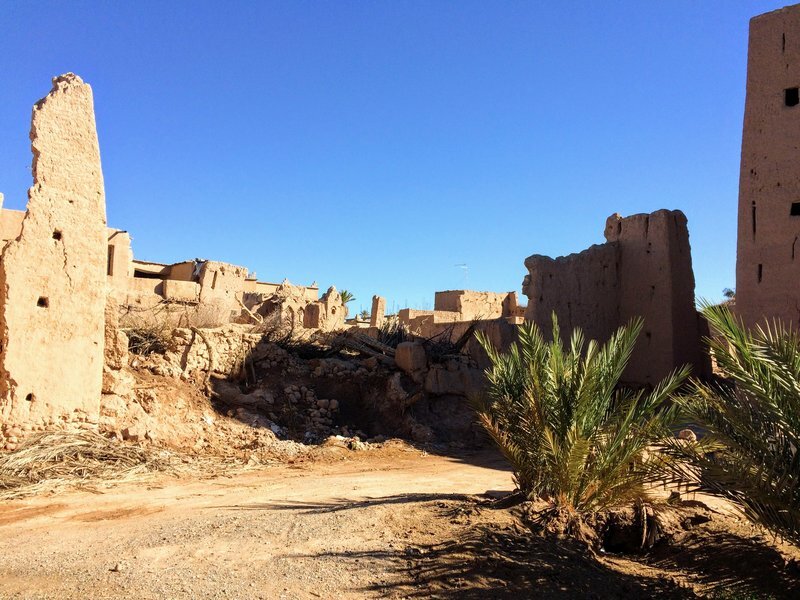 We loved this place and the journey so far inspired us to take ourselves further into the Southern Draa Valley…. 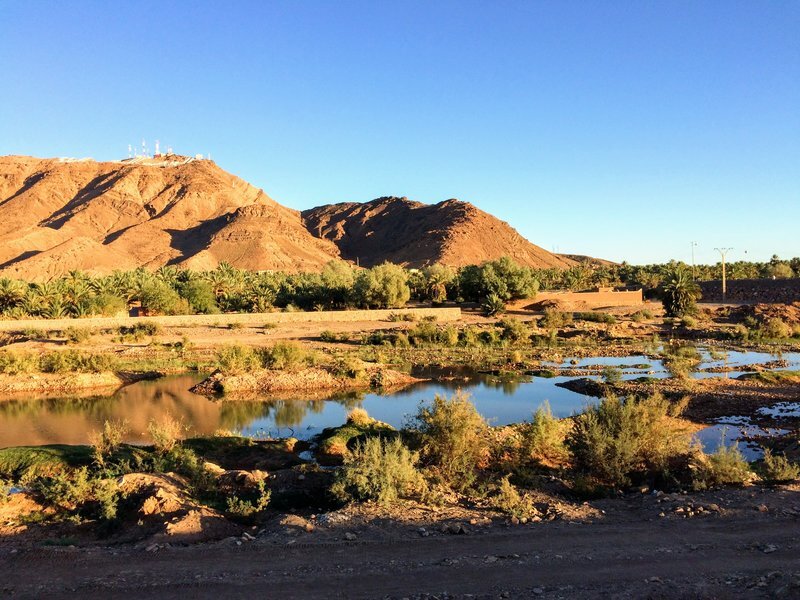 However, I had also heard that the Dades river valley through Ouarzazate and Skoura was beautiful, so we took a 1-night detour to Skoura, just east of Ouarzazate. View Morocco Road Trip on Libbytes’s travel map. 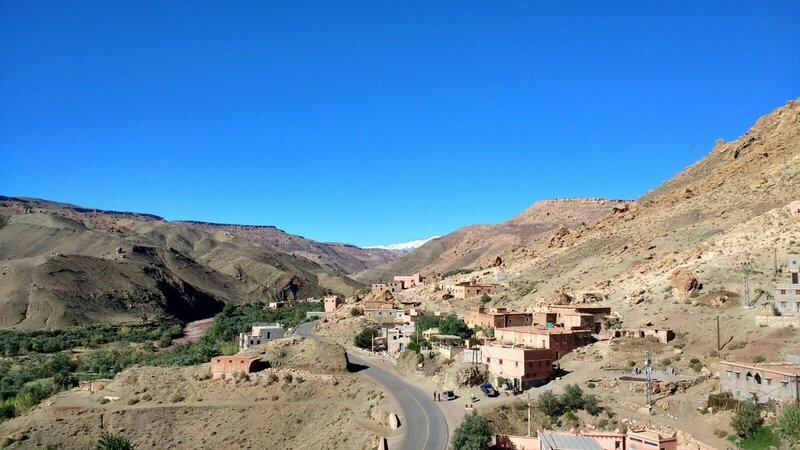 In hindsight, Pete and I wished that we had skipped our detour along the Dades to Skoura and gone straight to the desert at M’Hamid, but that’s part of the adventure and I had read that the Dades Gorge and River was home to some of the most spectacular oases and sights. 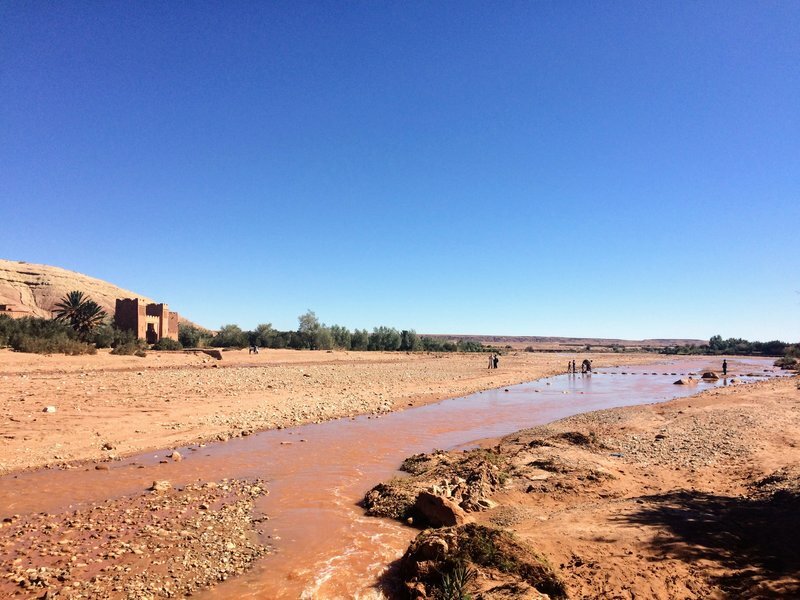 So we set off from Ait Ben Haddou along the N10 to Skoura. 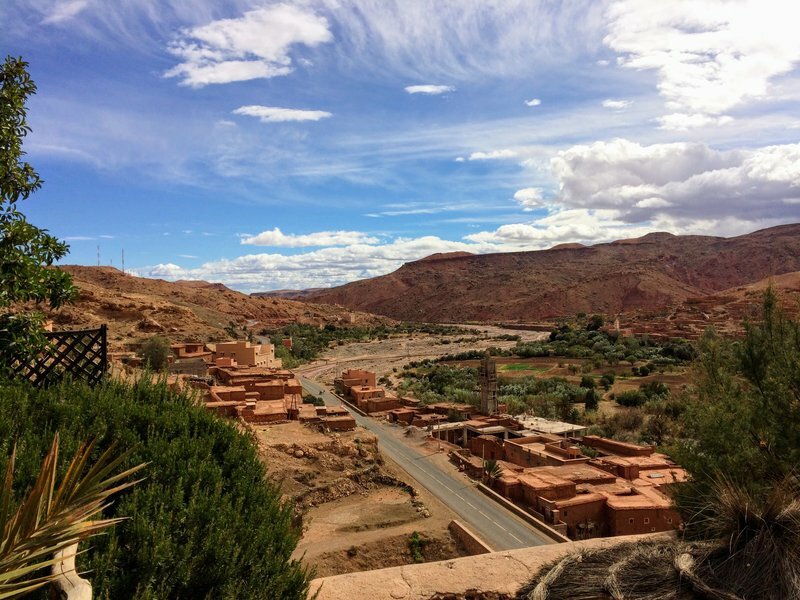 The road took us through Ouarzazate, a large city South of the Atlas mountains which is also home to some of Morocco’s largest filming locations and studios. The city is therefore decorated with multiple “movie” sculptures at every roundabout! 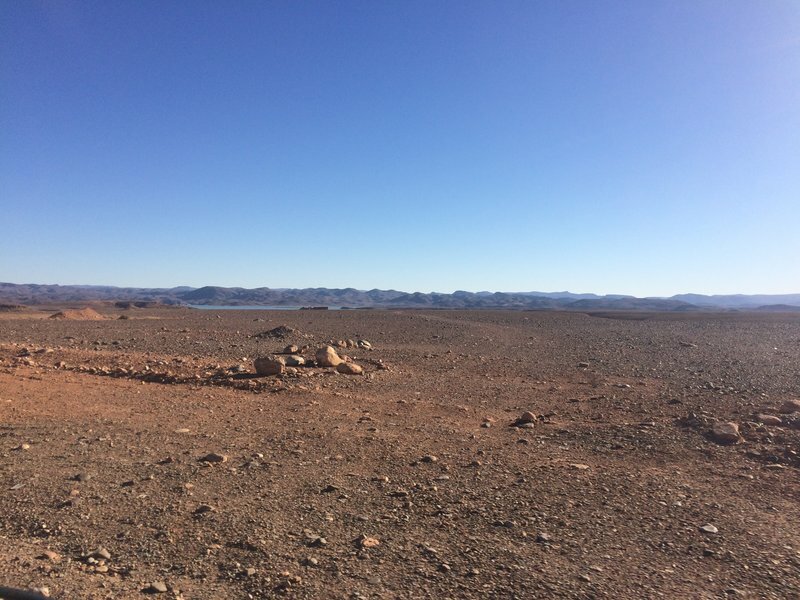 Out the other side of Ouarzazate, the landscape changed and it did feel like we were suddenly on Mars (I guess because all the TV and films I’ve ever seen that are ‘on Mars’ are filmed here!!). 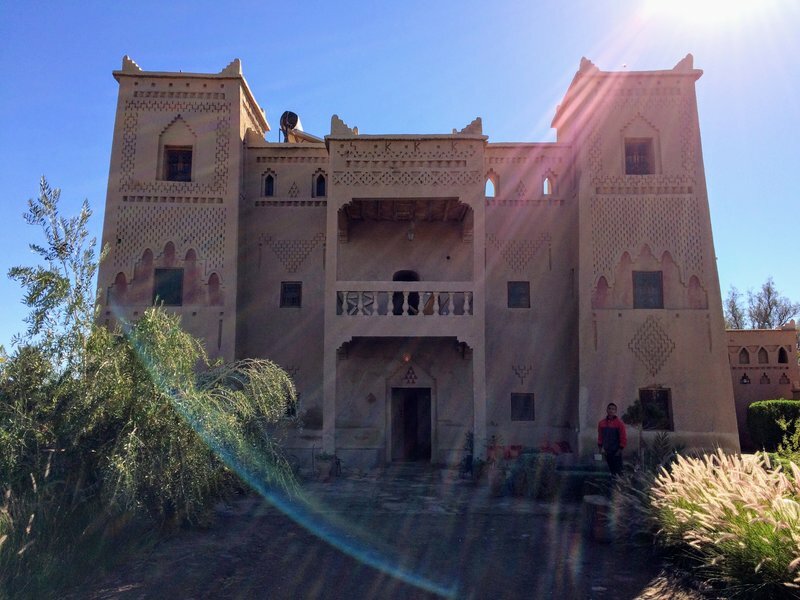 The drive was not far, so it was not long before we reached our destination; Dar Es Salam in Skoura Oasis. 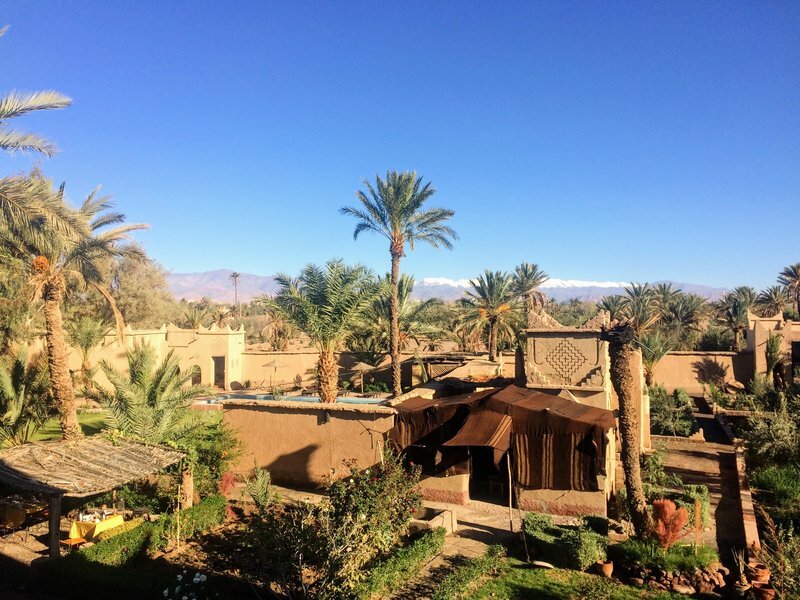 It was a beautifully restored kasbah with intricately carved walls and colourful gardens. 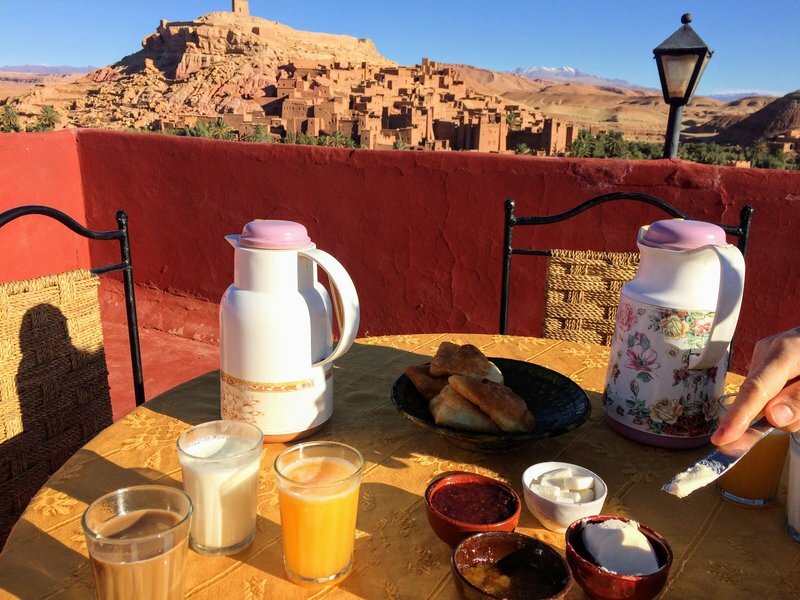 Our tea here was also possibly the best Berber food we had on our trip. 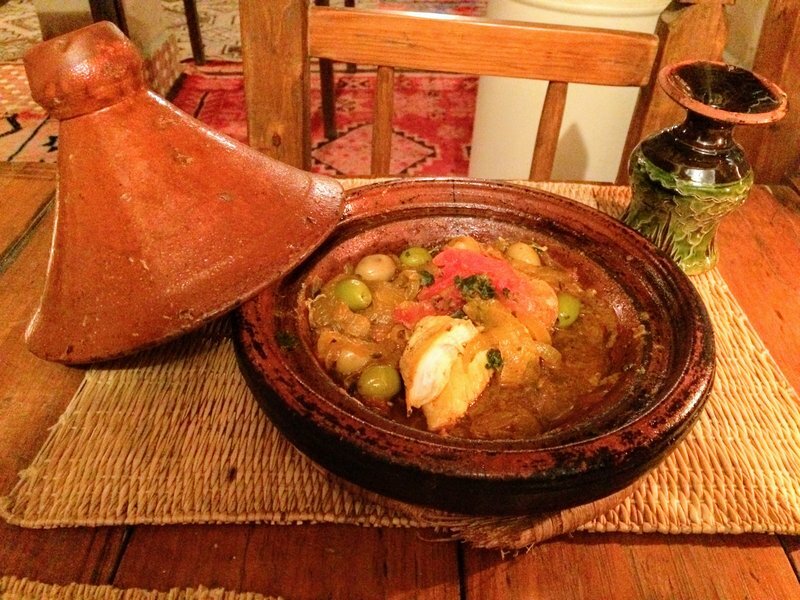 Just a simple tagine, but perfectly balanced flavours. 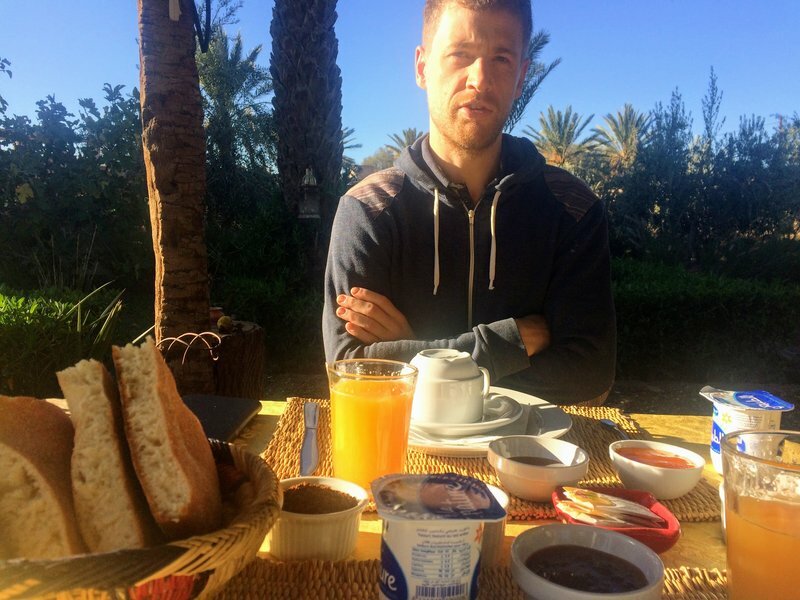 The breakfast in the morning was also delicious, Moroccan pancakes and bread, which we enjoyed in the gardens. 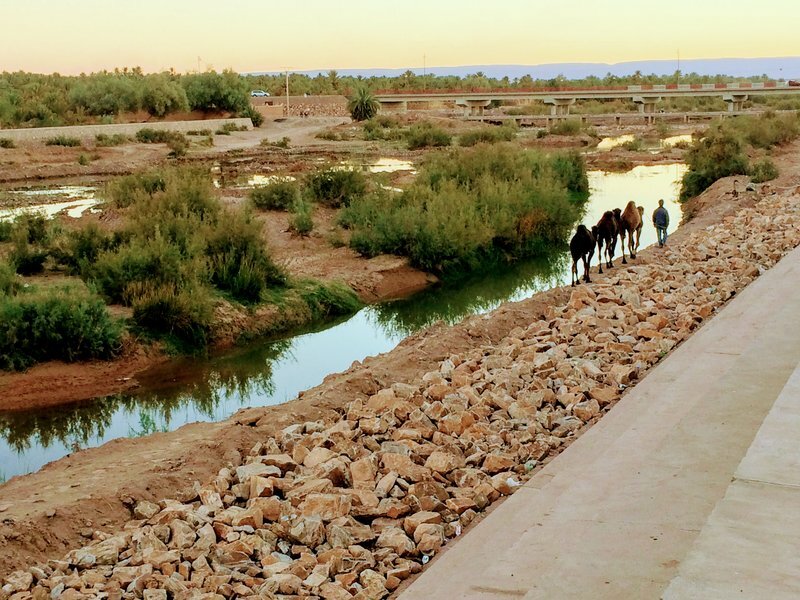 Skoura was a pretty town, and cycling around the oasis and through the village was fun. 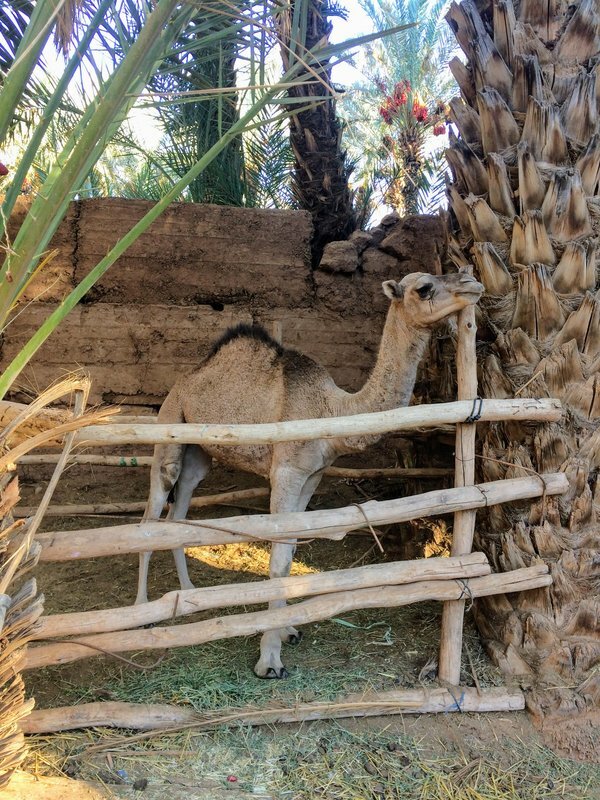 But as I said, in hindsight, this part of the holiday could have been cut out as we would have much rather stayed an extra night in the desert or elsewhere along the Draa Valley which we preferred. 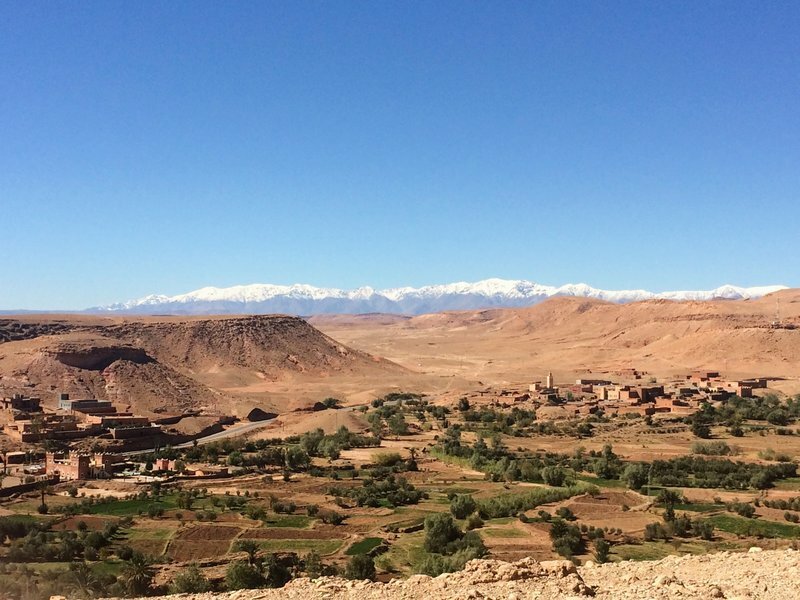 From Skoura, we headed back towards Ouarzazate and then South along the N9 again following the Draa river valley. This part of the journey really was my favourite I think, the landscape seemed to change around every corner (and there were a lot of corners!). 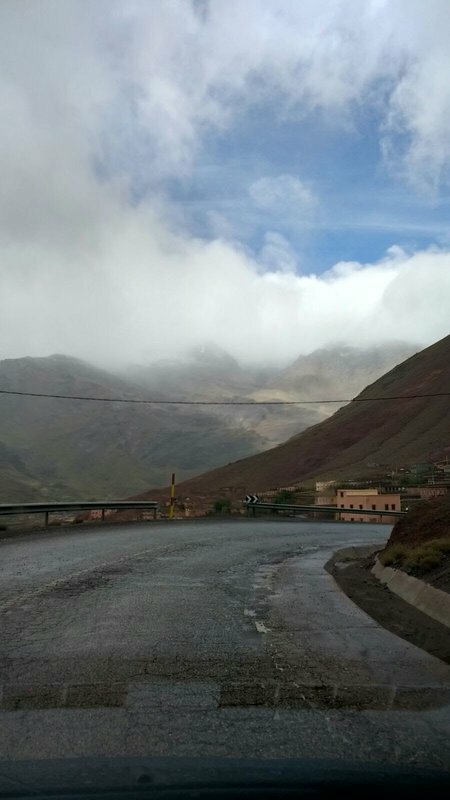 The road took us through the major town of Agdz where we stopped for a quick lunch before continuing down to Zagora. 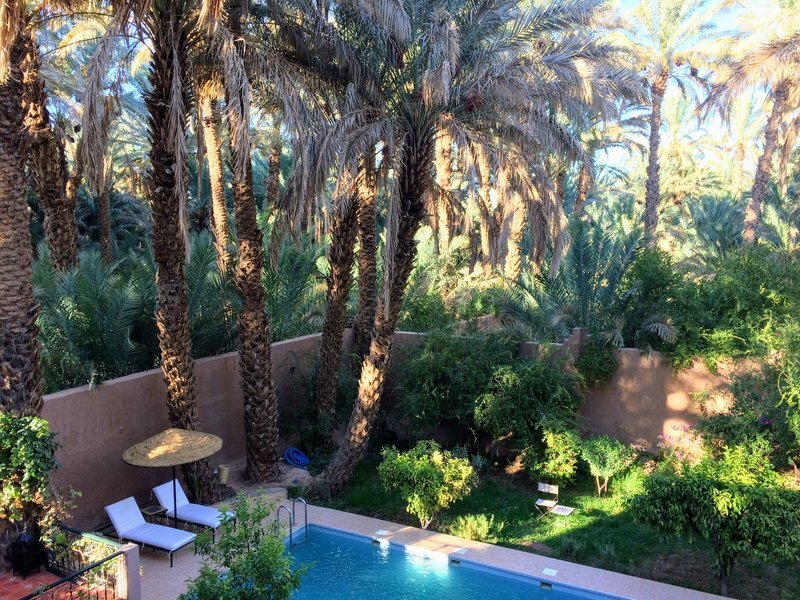 In Zagora we stayed at Riad Soleil Du Monde, a lovely riad just outside of Zagora. 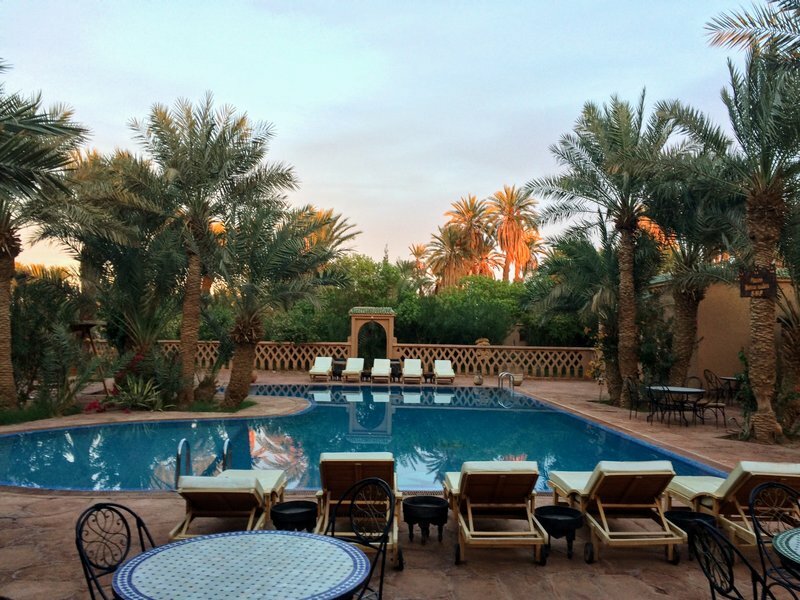 This Riad also had free bikes for rent and so we took the opportunity to cycle around the city before the sunset. 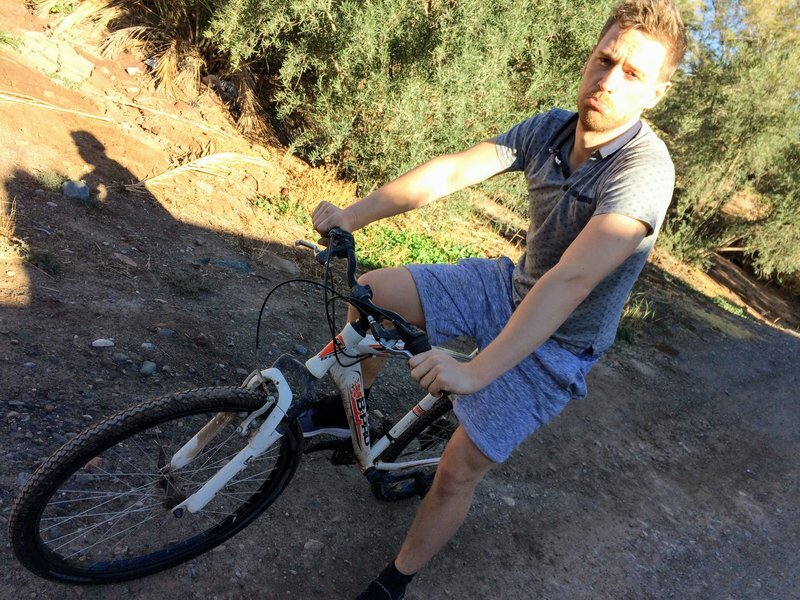 The cycling took us along the river and through the backstreets of Zagora enjoying an ice-cream at the main square. 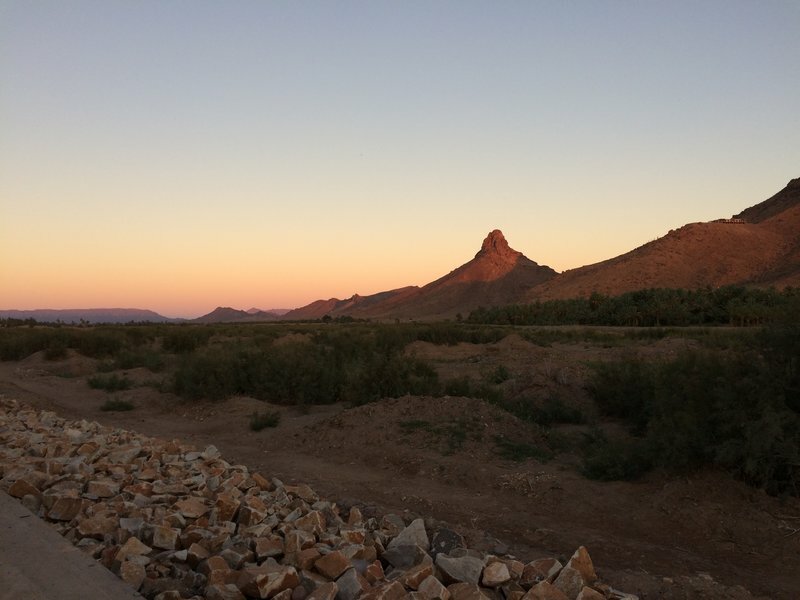 As the sun began to set we sat on the riverbank and watched as a farmer moved his noisy camels and the sun disappeared behind Zagora mountain. 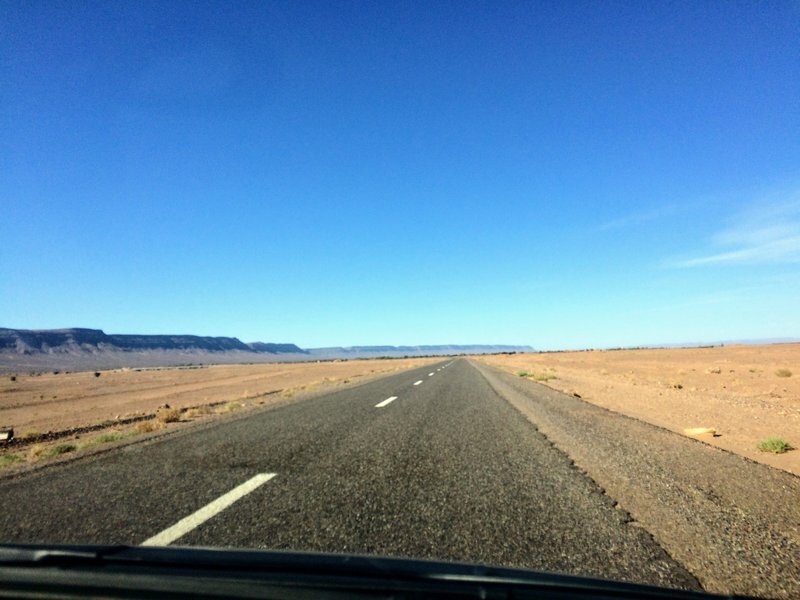 From Zagora it was a long drive to the desert. 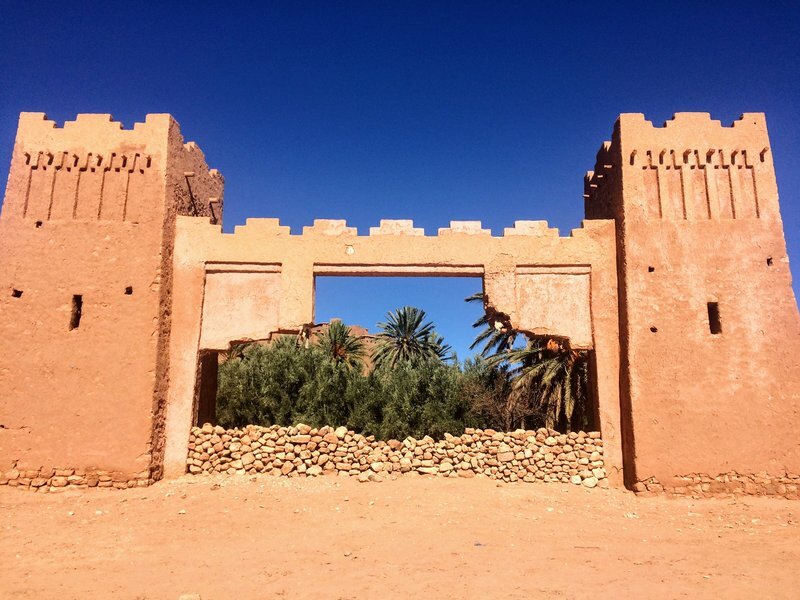 M’hamid is often called ‘the gateway to the desert’, where people go to experience sand dunes and stars. The road was surprisingly good for most of the way, with only part of the way being a single-track road. Once again, the views were incredible. 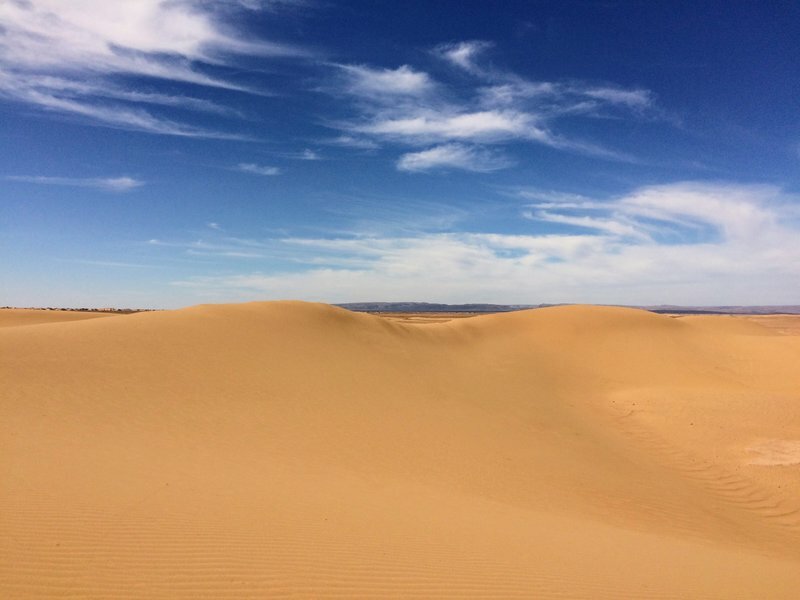 The desert crept up on you with small sand dunes appearing sparsely at the start of the journey, eventually turning into large dunes and finally sand for as far as you could see. 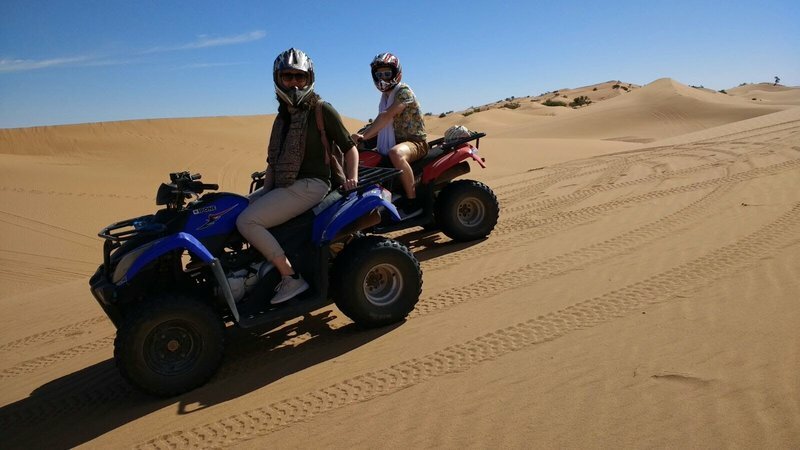 It took us nearly half an hour to negotiate a price for the quad-biking, as we were told in Zagora to pay no more than $25-30 each… we ended up paying $35 after getting them down from $50. The negotiating experience was quite stressful, especially since it takes so long. The locals want to drink tea and do it slowly, enjoy it. 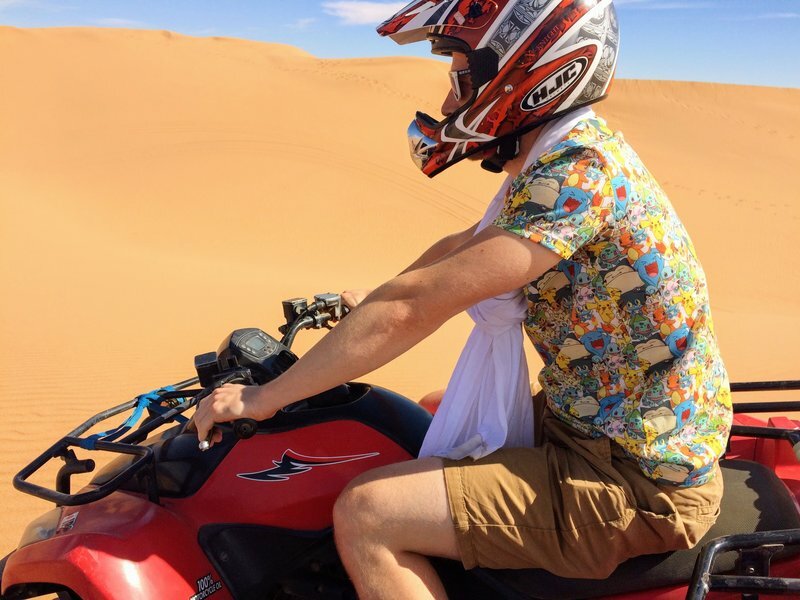 We just wanted to go quad-biking and not waste time worrying about money! Quad biking was AMAZING though, we absolutely loved it, especially Pete! The sand dunes were much bigger than we had expected, we felt in the middle of nowhere at times as there were some points where all we could see 360 degrees around us was desert! 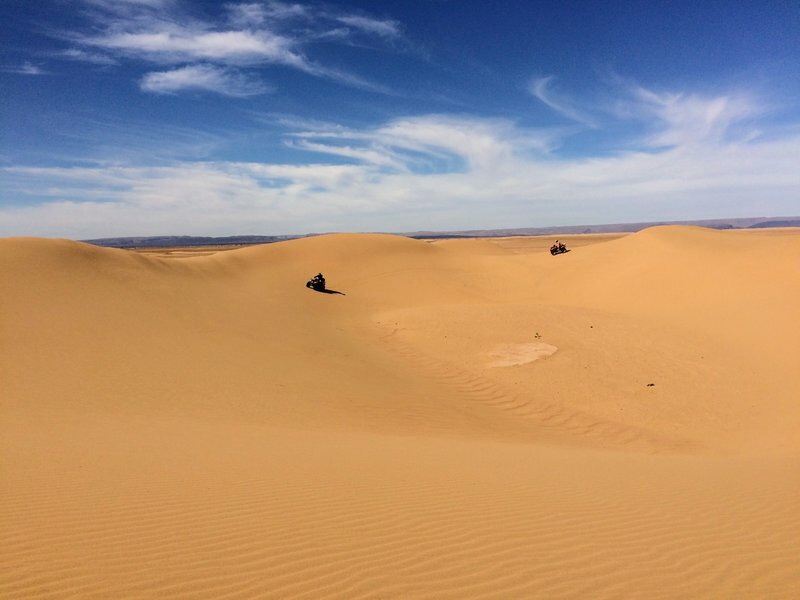 When we returned to the quad organisers, they caught wind on us wanting to camp in the desert and we ended up negotiating with them again for roughly an hour on the price of a night on the large dunes Erg Chegaga. 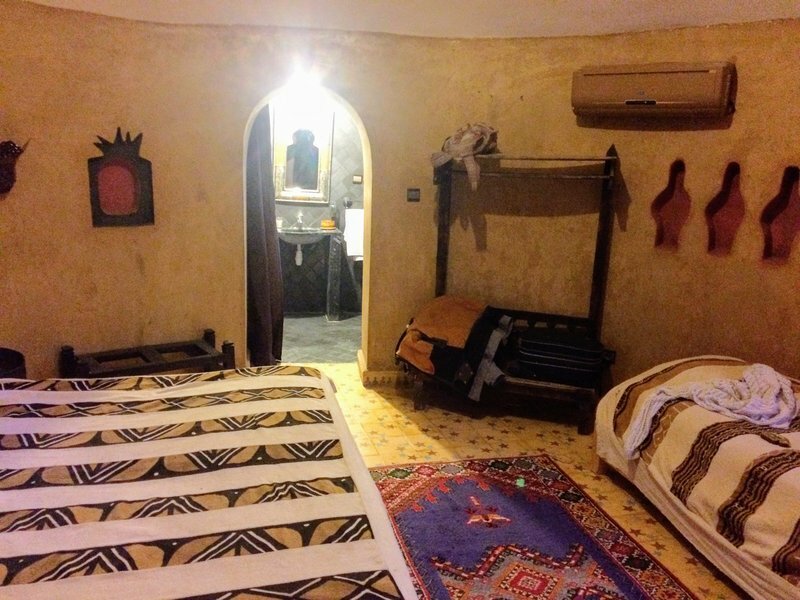 The price they wanted we felt was unreasonable and more than what we were offered in Zagora! 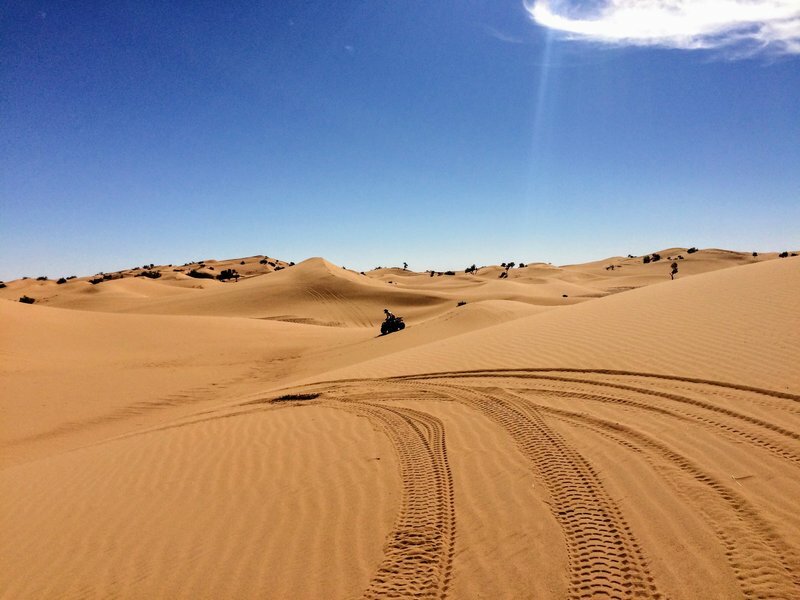 After another long and stressful negotiation, the decision was that we would drive ourselves to a smaller, more local dune and stay at a campsite there. By doing this we would save the cost of the 4×4 to take us. The guys assured us that the road was good and that our car would make it. The deal was that our ‘helper’ from the shop would also continue with us as our ‘guide’… despite again us asking him to leave. This kind of situation made us very uncomfortable. It wasn’t the first time a local had put a lot of time and effort into ‘helping’ us – this guy had his own shop to run, and instead wanted to be a guide for us overnight?! We were never sure what the reason for the help was. We wanted to believe that the ‘help’ was genuine, but we couldn’t help but feel that often there was an ulterior motive… I’m certain that we were paying for this help in higher prices. 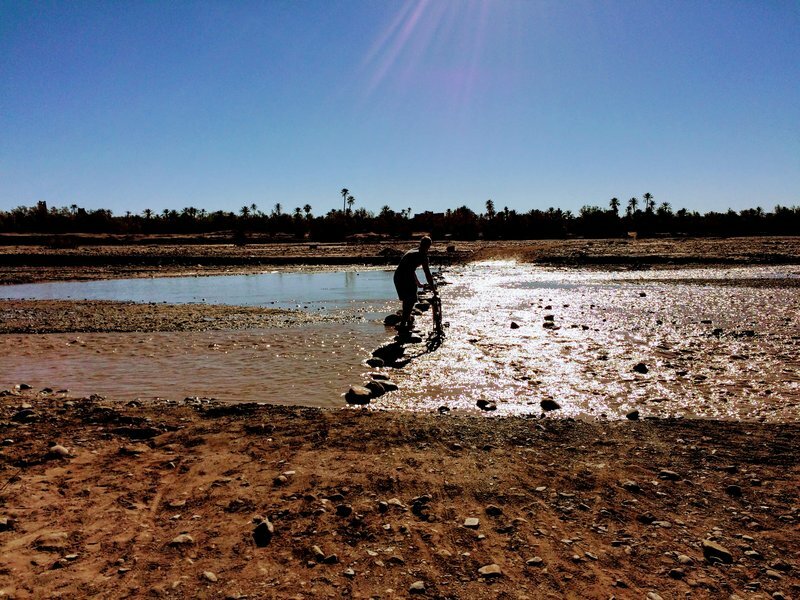 But we were conscious about not being prejudice after all the Moroccan culture is different, we wanted to accept and embrace that, but we just couldn’t shake the feeling that we were being exploited at times…. We decided to take a leap of faith and drove with our guide out towards the campsite. The road started well, fully tarmacked, but then our guide asked us to turn off road… We were not sure of this but were promised by our guide that it was just this first bit and the road would return. We drove off-road for about 40 minutes. We didn’t go particularly far, it was just slow going and difficult terrain. Eventually, we got stuck. It seemed inevitable, despite the positivity of our guide. 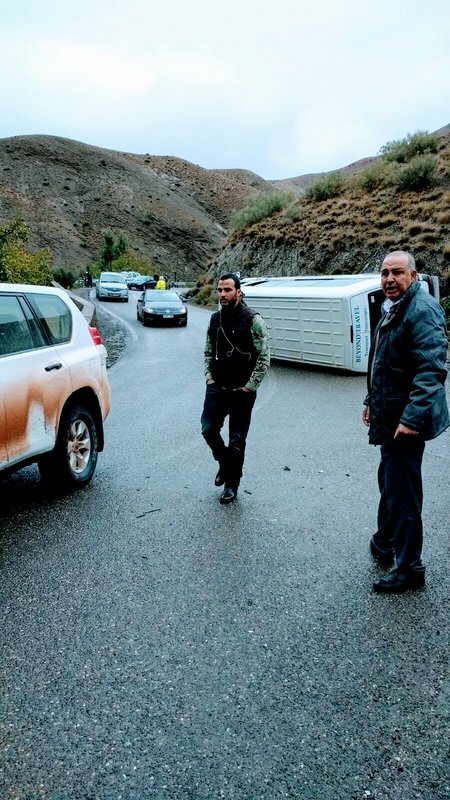 Mohammed promised us the road would get better, but with the sun beginning to set we decided it was just too dangerous and turned around after we freed the car. At this point, our guide told us there was a different “better” road, which was fully tarmacked the whole way but by this point, our trust was lost, we couldn’t understand why he didn’t take us that way first!! They asked us to pay for the tent and food since they had already set it up for us. We refused and after a strong and stressful negotiation, we were finally free of our guide and back on the road by ourselves feeling both guilty (for wasting Mohammed’s time) and disappointed (at not camping under the stars). 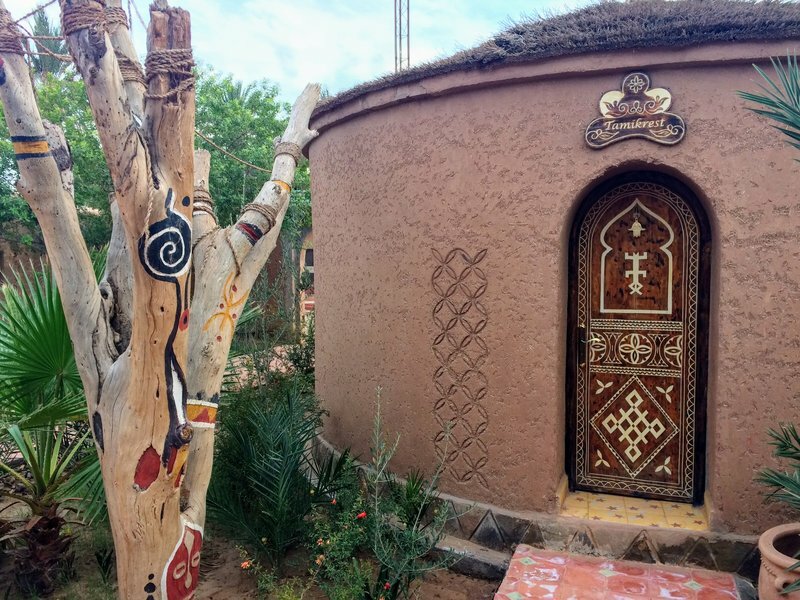 The stressful situation left us exhausted, so I decided to treat us to a special hotel for a night and so we stayed in one of the African bungalows at Chez La Pacha. The hotel was stunning, we loved our room and the gardens and the pool were peaceful. We had a few drinks to unwind. The following day we decided to chill some more. 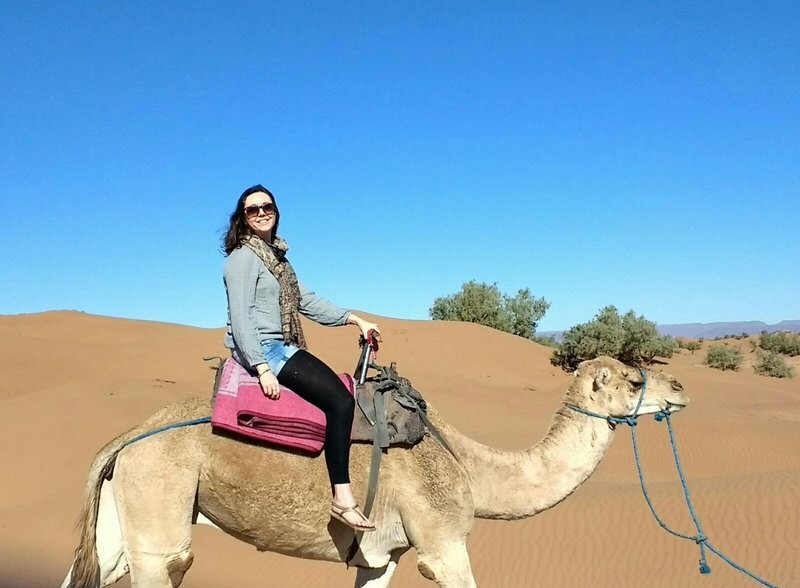 I wanted to go for a camel ride, however, Pete’s not a big fan of Camels, so we settled on me riding a camel and Pete to walk next to me! 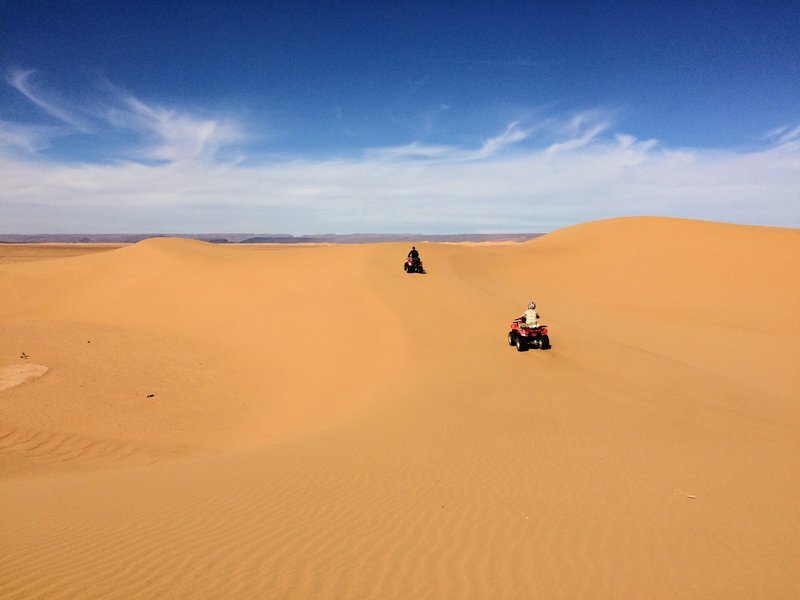 The ride/walk was very relaxing and tranquil and once again we were amazed by the dunes. 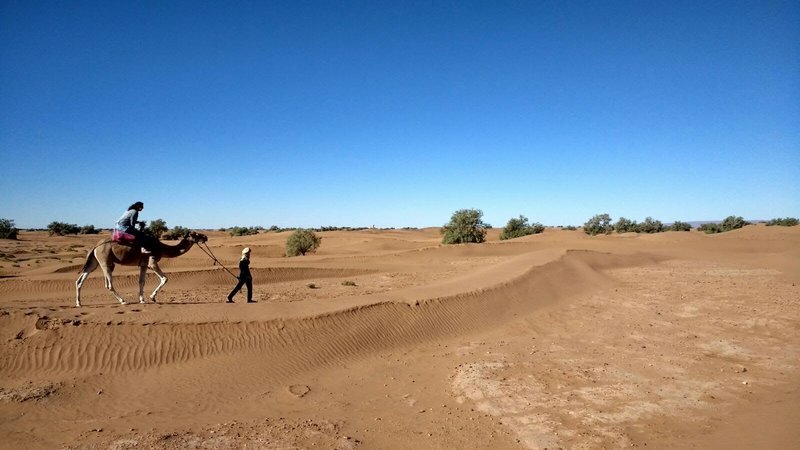 The camel gave me a great vantage point to look out over the landscape, and the slow pace of the camel compared to the quads made the desert feel completely different. 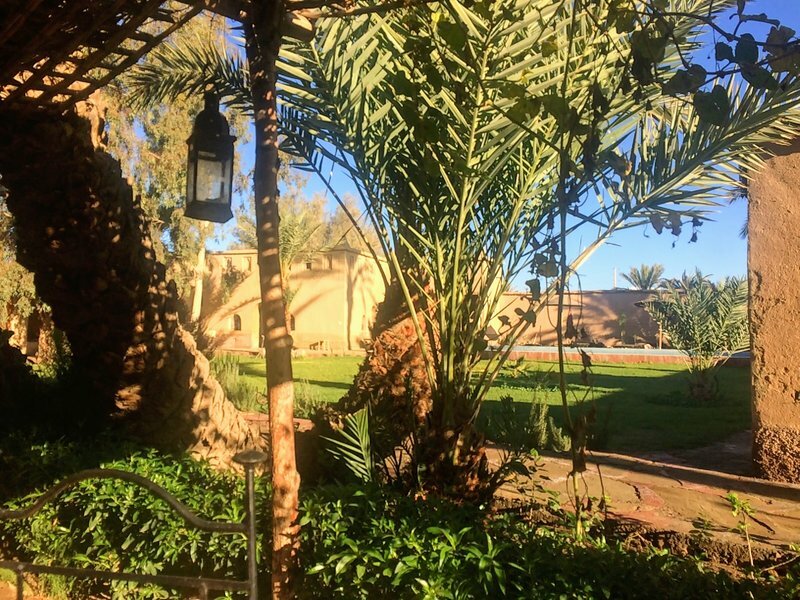 We decided to begin the journey back to Marrakech on Friday so we could relax more on Saturday and not have to worry about getting to the airport. 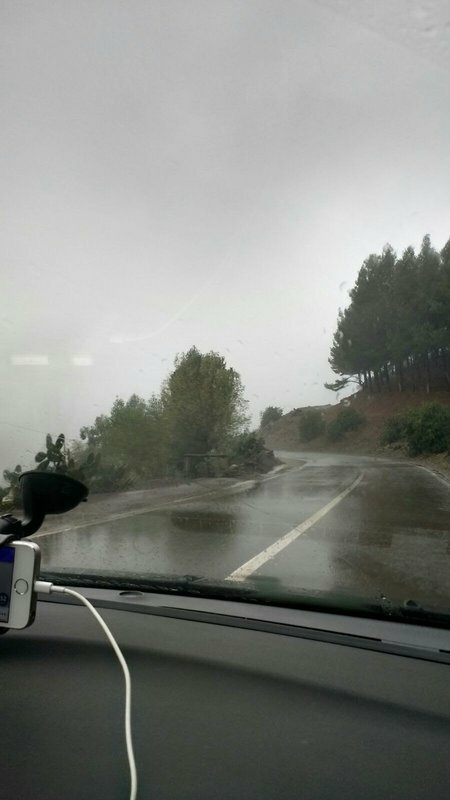 The drive wasn’t that far, but the roads on the way had been unpredictable so we were playing it safe. 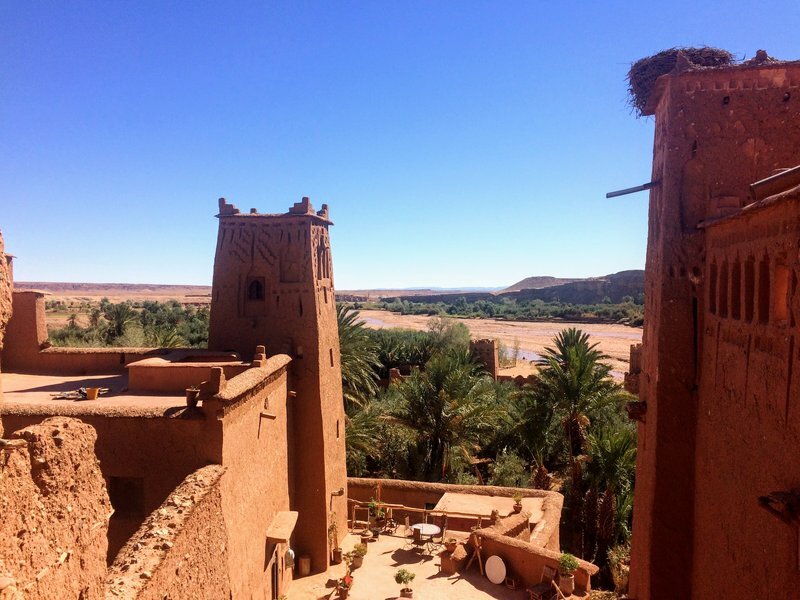 We decided to leave straight after the morning camel ride and stop halfway for lunch, before staying overnight at our favourite; Ait Ben Haddou. 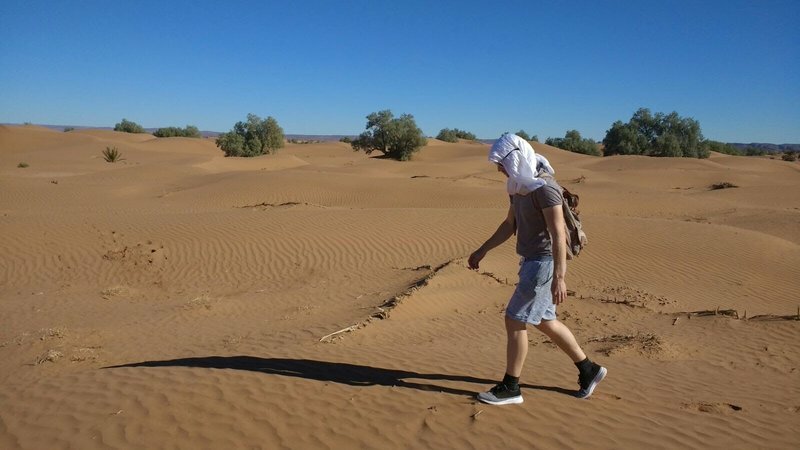 That was so on Saturday we’d only have a 2-hour drive back to Marrakech. The plan was perfect…. Pete was shocked and not sure of what had just happened. He went to the toilet to look in the mirror. Both of us had a look in his eye and couldn’t see a thing. We thought we must be exaggerating what had happened. We waited for a few minutes to see if the sensation in his eye would go, but it only got worse until Pete described the feeling as “wriggling”. That got me worried and so I googled ‘fly squirts something in eye morocco’… I did not like what I saw and got quite panicky. Quickly, the strange sensation turned to pain and Pete was soon in agony with the pain of wriggling in his eye. 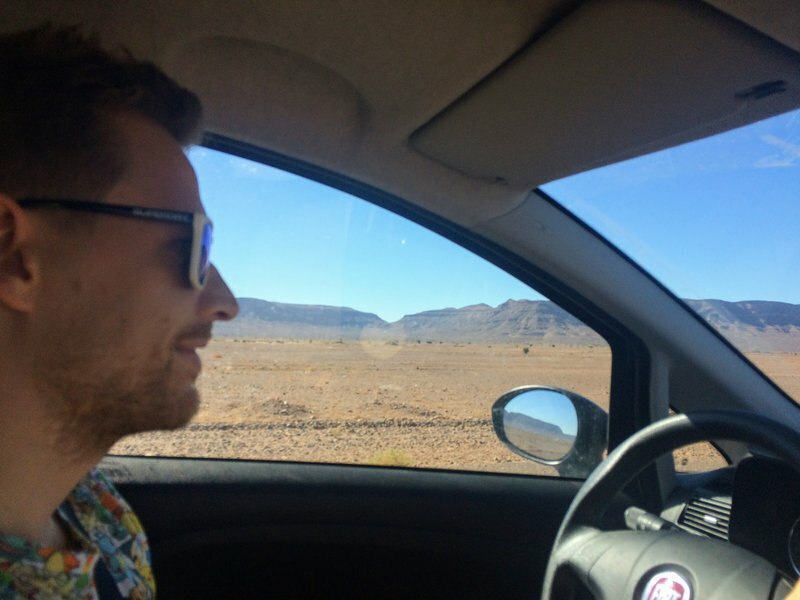 We checked the maps for hospitals, the closest one was back in Zagora or onward to Ouarzazate, so we decided to continue on with me now driving. Hoping to stop at a pharmacy in Agdz on the way. We stopped at the first pharmacy we saw and told the people and the resident doctor what had happened. They told us to calm down and that everything was fine. The pharmacist gave Pete some eye drops for conjunctivitis and said it would be fine in a few minutes to an hour. We relaxed slightly, maybe it wasn’t so bad. Pete used the drops immediately but felt no relief so about 5 mins down the road on the way out of Agdz we stopped at a second pharmacy. This place was worse and even laughed at us saying that we were being mad. The wriggling feeling Pete could feel lead us to believe that perhaps fly larvae had been deposited into his eye, but the pharmacist said this was not the case and that the drops we had already been given would do the trick. 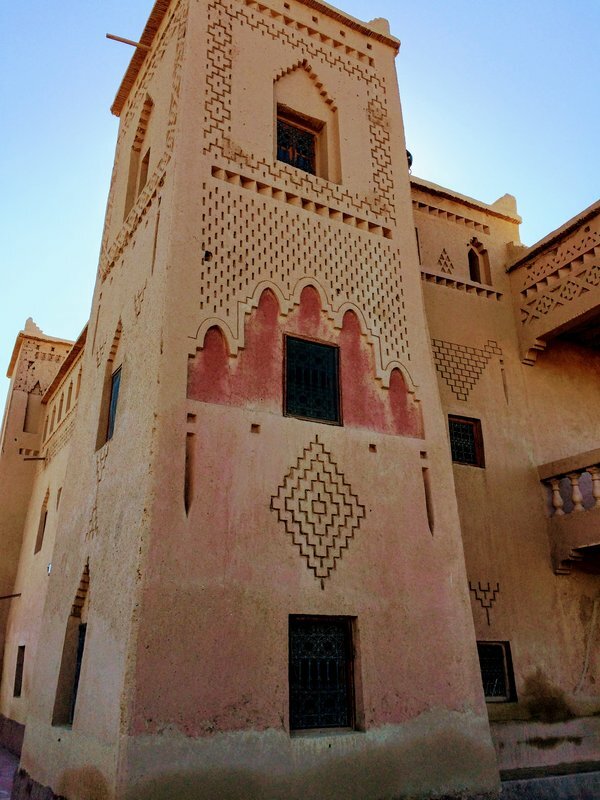 2 painful and stressful hours later we arrived in Ouarzazate and went to a pharmacy to ask for directions to A&E. 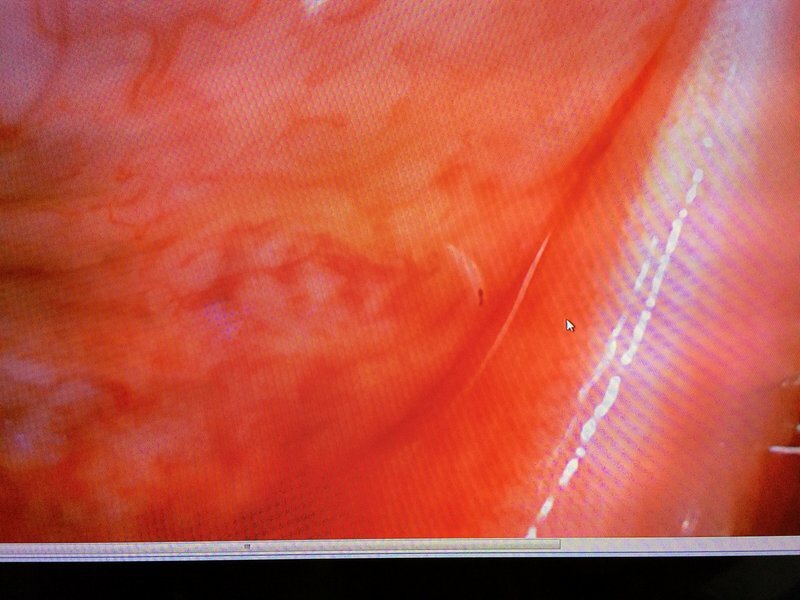 The lady at this pharmacy understood us more clearly and told us the situation was very serious and that Pete did, in fact, have fly larvae in his eye…. She gave us directions to the polyclinic which had an ophthalmologist specialist for emergencies. We went straight there. It took us a while to find, but eventually, we were with the doctor and calmer. 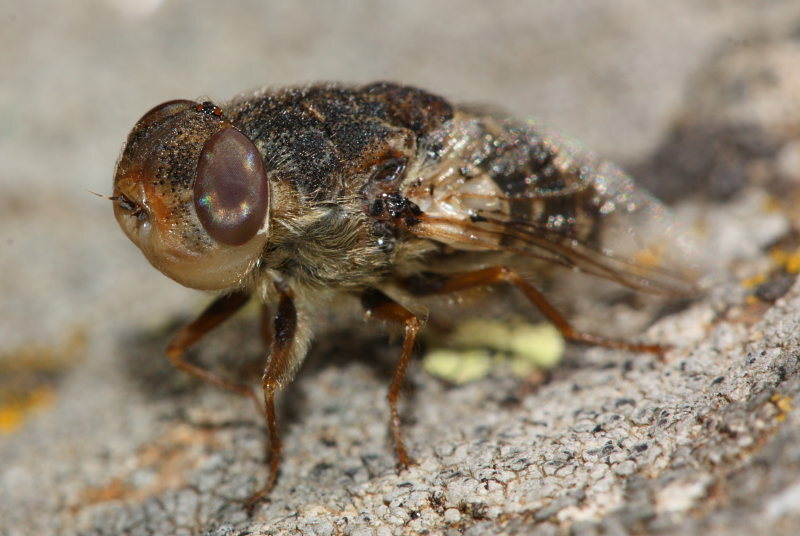 The bot fly is trying to deposit its larvae into sheep or camel nostrils where they develop fully in the mucus, however, during Autumn months they can often mistake human eyes as hosts. It’s not serious and usually only leads to conjunctivitis, but there are reports of people losing their eyes, so we are glad we were able to get this dealt with as soon as we were able. The doctor got as many of the fly larvae out of Pete’s eye as he could, but the procedure was painful. 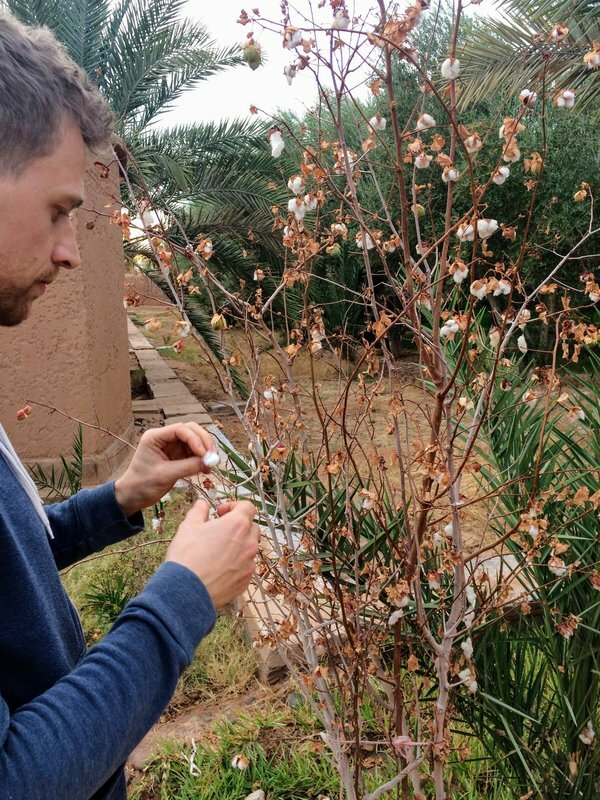 He basically just used cotton buds to scrape them out… Pete was left with 3 or 4 in his eye and given steroid drops and cream which he was to apply for the next 2 weeks. 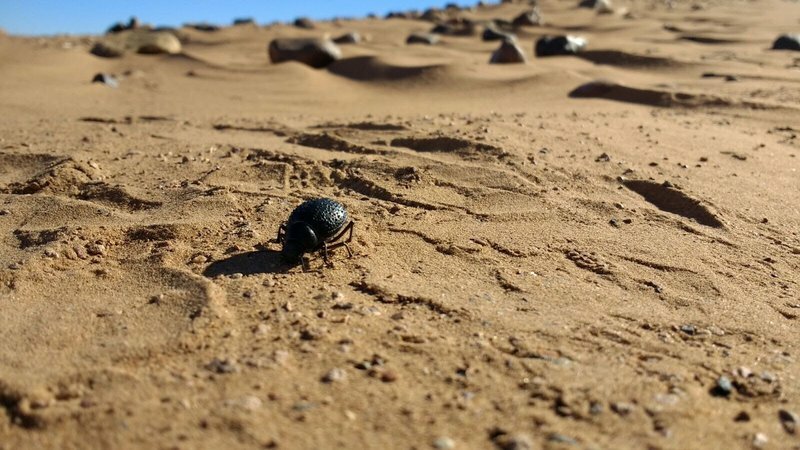 The doctor said the drops would paralyse the larvae within 2 days and they would fall out of his eye. All-in-all it was a pretty horrific experience even for me, so I can only imagine what Pete was feeling. He dealt with it very well and we tried to enjoy the rest of our holiday as best we could. 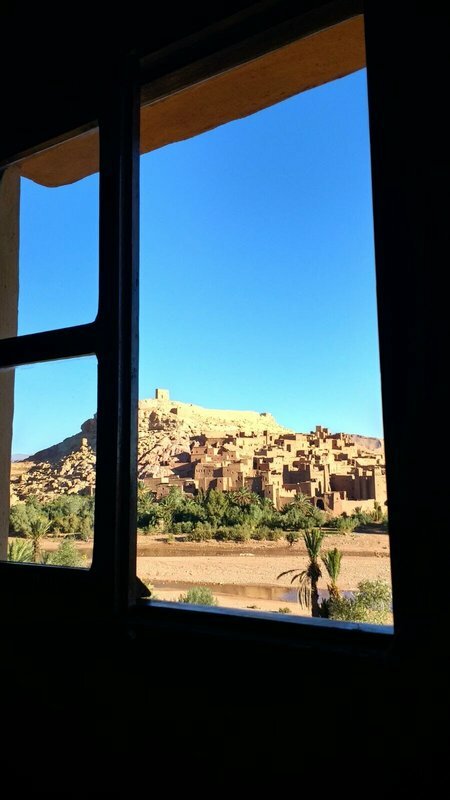 We stayed that night in Ait Ben Haddou again, using the experience of our first visit, we decided to stay at Chez Brahim, one of the houses with a view of the old kasbah and we were not disappointed, it was my favourite place we stayed, simply because of the view. 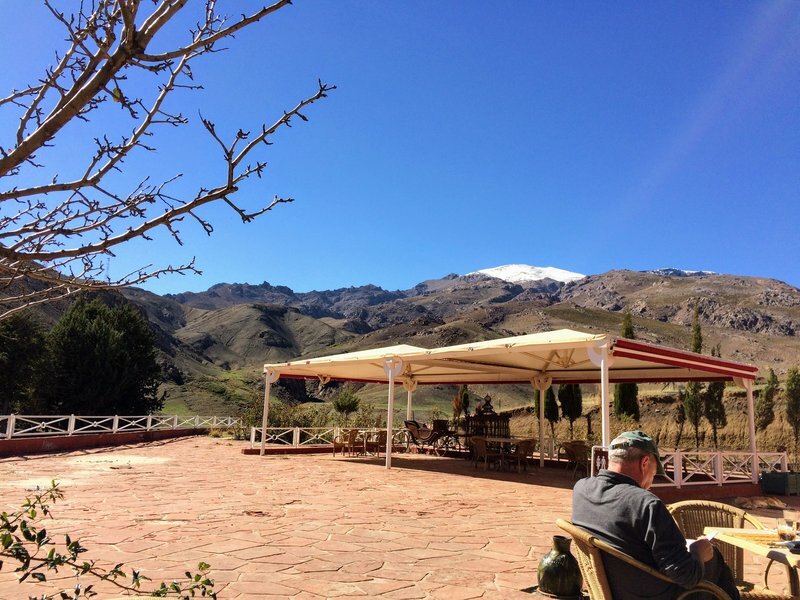 The next morning we drove back over the Atlas mountains, stopping briefly for lunch half way at Café Assanfou, before continuing to the airport in time for our flight home. 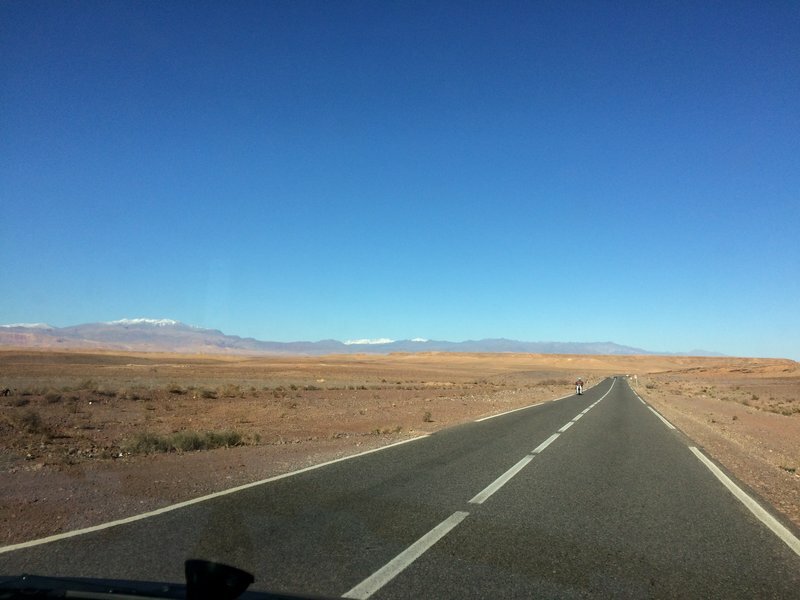 This time we drove along the N9 Tizi N’Tichka in the sun and as we predicted, it was our new favourite road in Southern Morocco! It’s just a shame we couldn’t enjoy it more. Pete was in a lot of pain, so we didn’t stop often and just tried to get home as soon as we could. 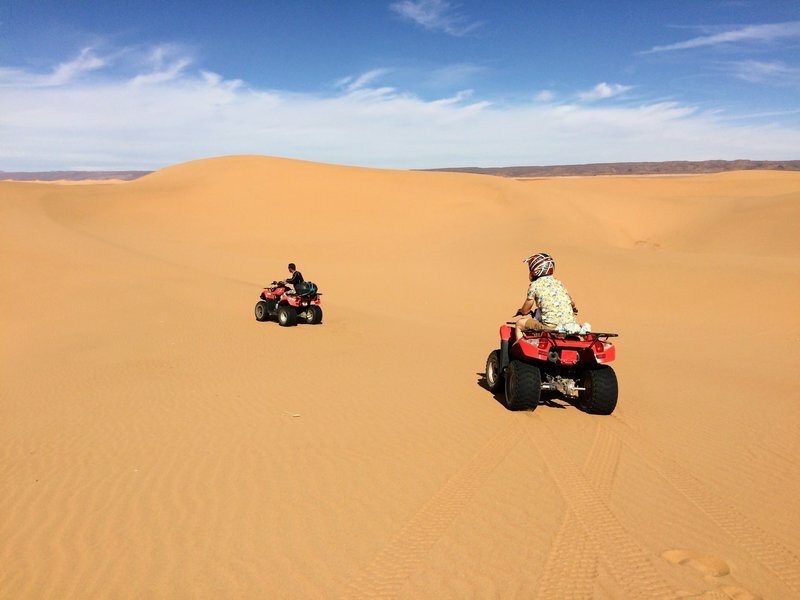 We really enjoyed our Moroccan adventure (apart from the fly larvae bit). 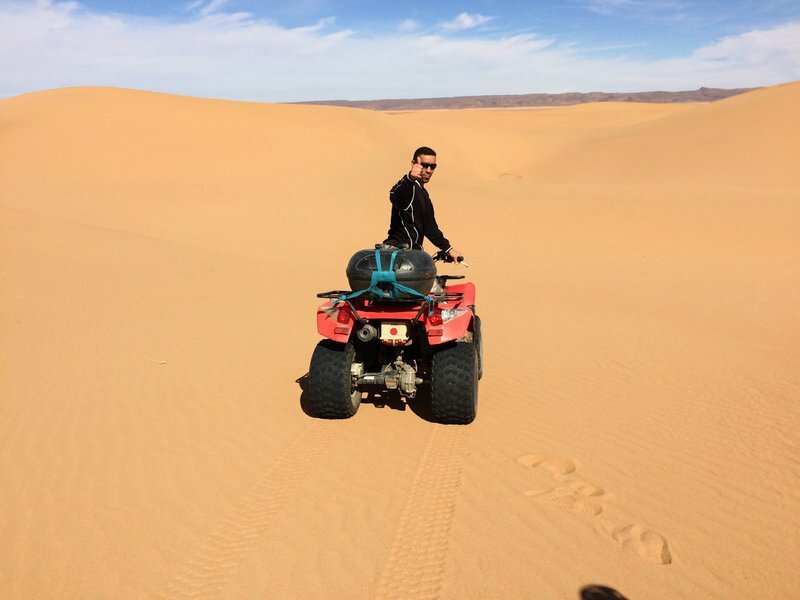 The landscapes and scenery of Morocco are inspiring, I had no idea it would be so beautiful. 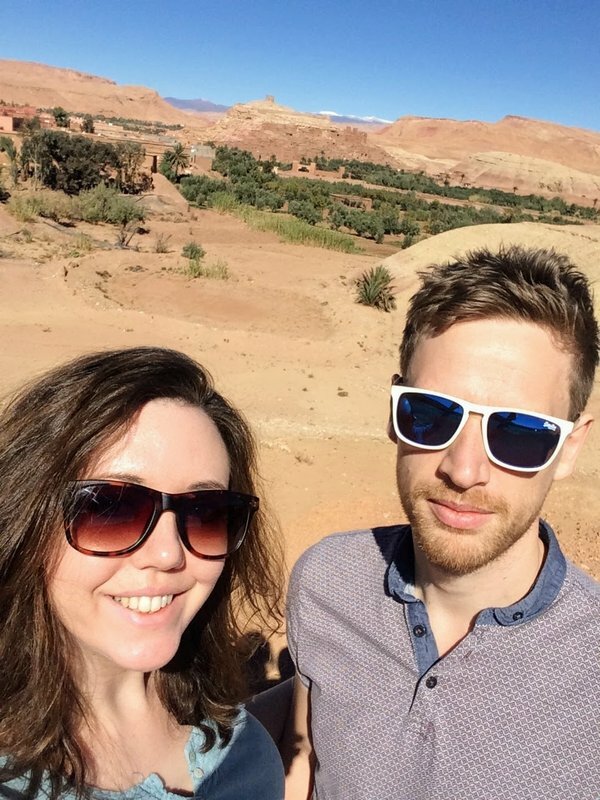 We had a few stresses with the cultural differences, the haggling and hassle we received were at times overwhelming, but we tried to be open-minded and gave people chances when we could. 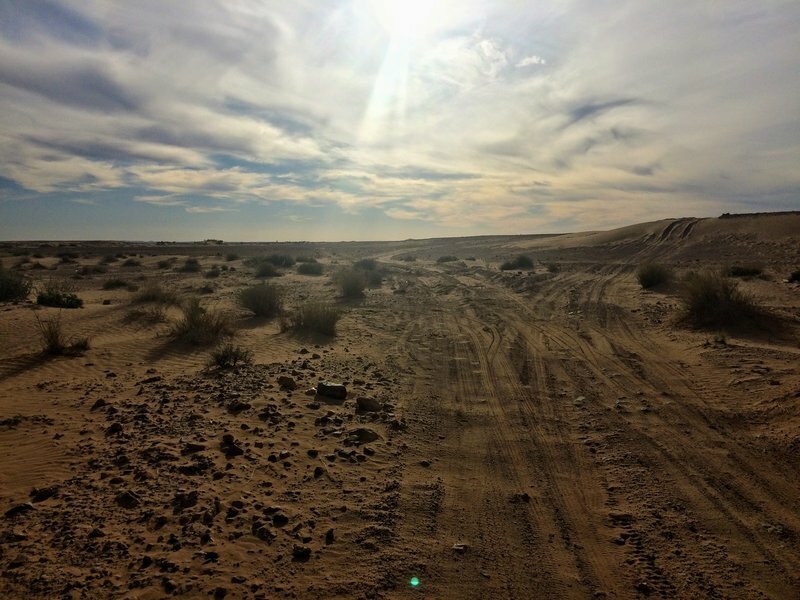 If we were to come back, I think we would have headed directly to the desert, camped out there and done activities and stargazing. In hindsight, we tried to pack too much into the short week and ended up spending most days driving.